You will arrive at Jaen airport and be transferred to the selected hotel. 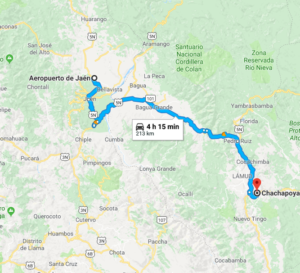 A transportation service will pick you up and take you in the direction of the village of Huancas where you can admire an impressionist view of the Canyon of Sonche River before returning to Chachapoyas for the evening. Accommodation: in the selected hotel. Full Day Kuelap with lunch included. In the morning, you will leave with a private vehicle in the direction of the village of Tingo where you will take the cable car to Kuelap fortress, the famous archaeological site of Chachapoyas with 600m long and 20m high walls. It is the best known in the region but also the largest Prehispanic archaeological site. The site consists of several sectors, the Malca the fortress, and Barreta’s fortress which particularly stands out. The fortress of Kuelap, built around 500 B.C., is located at 3000m altitude on a plateau dominated by the Valley of the Utcubamba. It comes in the form of two large medians surrounded each of a wall on the East and South sides. It covers an extension of 6 hectares. The archaeological complex houses about 500 structures, at its peak the site housed about 3000-3500 inhabitants. A unique atmosphere in the streets of this citadel still enveloped by tropical vegetation. Full Day Gocta waterfall with boxed lunch included. Departure by private car to the village of Cocachimba where you will begin your hike to get to Gocta waterfalls, the third highest waterfall in the world with 770 m of height. 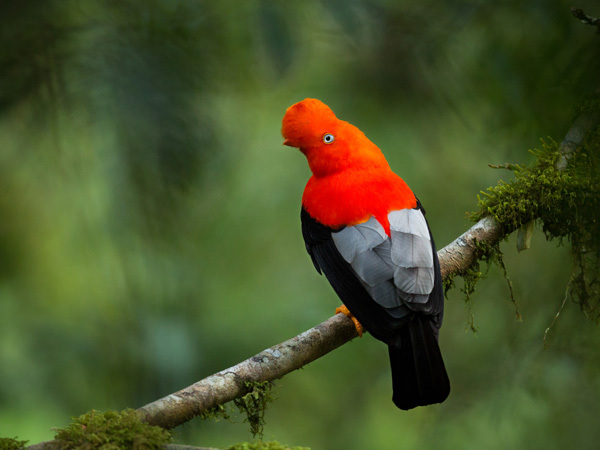 Through this walk, you will cross a landscaped forest of altitude with a wide variety of Flora and Fauna (birds, orchids, giant ferns, etc.). You will then take the time to admire the impressive show offered by this waterfall before returning to Chachapoyas. Meals included: Breakfast and box lunch. Full Day Mausoleo of Resvash & Leymebamba Museum with lunch. From Chachapoyas, you will go to the village of San Bartolo, where your walk will begin to reach Revash. 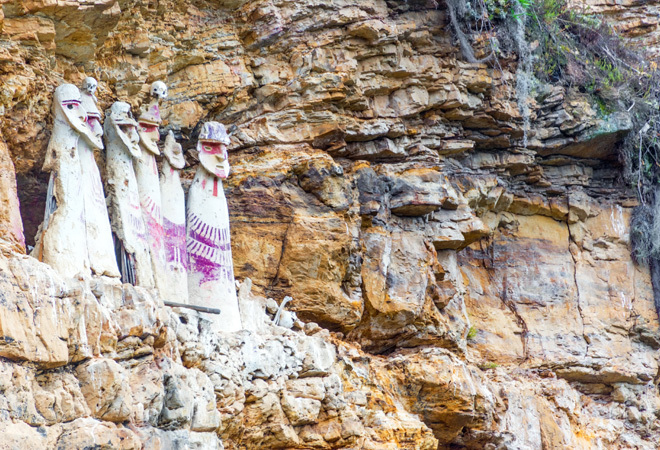 This funeral complex in Chachapoyas is made up of mausoleums (chullpas) of 1, 2 and 3 steps decorated by many red ochre paintings. “It’s a mystical atmosphere out in this little and dead village”. 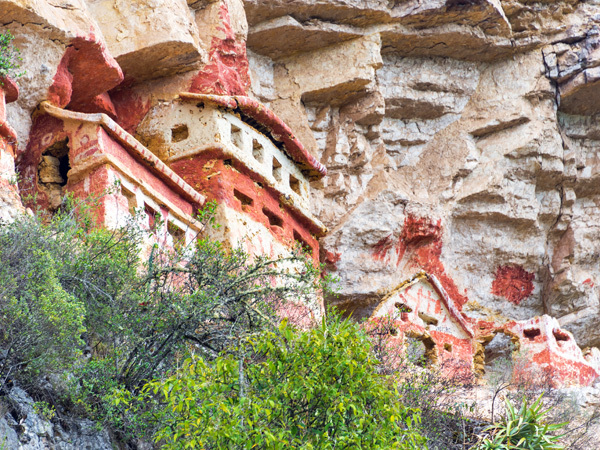 After lunch, you will go to the Museum of Leymebamba, home to more than 1000 archaeological artefacts including 220 mummies discovered in the mausoleums of the Condors lagoon. The Museum is also characterized by the presence of an orchids nursery and endemic plants. This museum is unique in its kind because it presents a real archaeological treasure. OPTION 4D/3N: Return to Chachapoyas. Transfer to the bus terminal (without a guide). 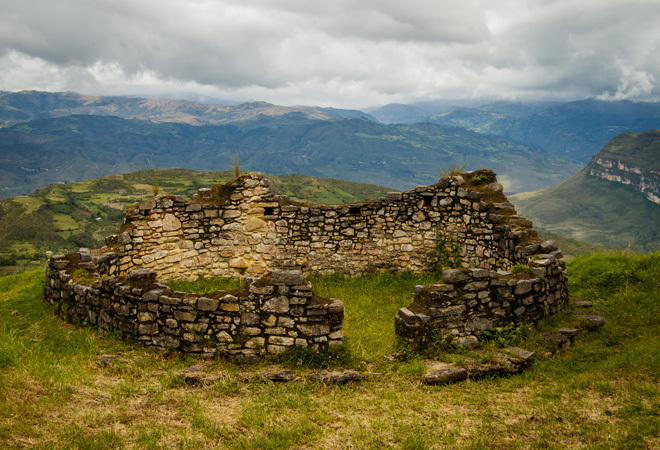 OPTION 5D/4N: Overnight at Chachapoyas. Accommodation: in selected hotel (For option 5D/4N). Meals included: Breakfast and lunch (For both options). You will be transferred to the Jaen Airport to either continue your tour to another city or return to Lima for your international return flight. Visit the surroundings of Chachapoyas to get off the beaten track and experience an incredible mix between the beautiful nature and hidden areological treasures, which luckily have become much more accessible in recent years. This trip will let you experience a breathtaking 771m high waterfall as well as constructions and burial sites made by ancient cultures while trekking along paths either by foot or riding on horseback. Please consult rates & accommodation options in the breakdown of services. If passengers will have transfer out to Jaen’s airport, they need to do the 5D/4N extension. 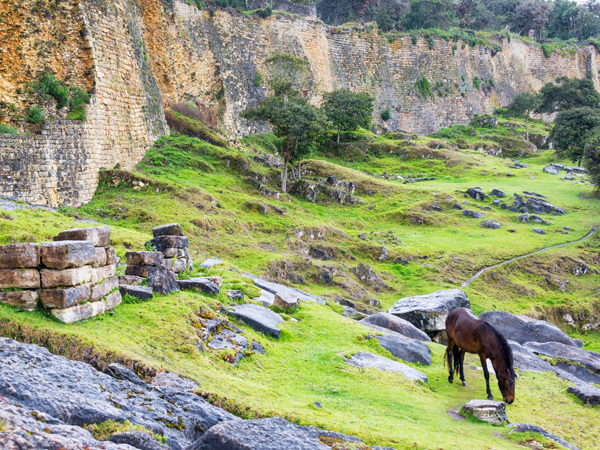 3 or 4 nights at Chachapoyas. Daily breakfast at the hotel, lunches and dinners as specified in the itinerary. All transfers are in private without guide. Entrance tickets to attractions mentioned in the itinerary. Personal expenses. Alcoholic and non-alcoholic beverages during meals. Meals not mentioned in the itinerary. Airline tickets and rates international and domestic shipping. This proposal is only a quote there is nothing booked. All services are in private. To review our Term & Conditions please click here. Comfortable and light clothing is the most convenient choice for traveling on Perus coast, while warmer clothes are best for stays in the highlands. Passengers must not wear sleeveless T-shirts, shorts, miniskirts or very tight clothes when visiting temples, religious places or official buildings. Sunblock lotion, sunglasses, a hat or cap and a mosquito repellent can be also very helpful during the trip. Please keep in mind that check-in hour in most hotels starts at 1:00 pm. Early-arriving guests will be subject to room availability while waiting in the hotel lobby.